Swimming is good exercise, but it doesn't always come naturally. You may want to improve your long-distance swimming ability if you're training for a triathalon or other competition. Because swimming puts less strain on your joints, you may just want to swim longer distances to improve your health. Learning to conserve oxygen, build stamina and move through the water with the least amount of resistance can help you swim half a mile or more. Do not swim long distances alone, especially if you're not a strong swimmer. Ask your doctor before starting a strenuous exercise program. While you may think you can't swim long distances because of muscle fatigue in your arms and legs, fatigue of the respiratory muscles, which help you breathe, may actually cause more fatigue in the water. When your respiratory muscles tire, your body diverts oxygen from other muscles to fuel the respiratory muscles, causing fatigue. A study conducted by researchers from the University at Buffalo and reported in the March 2010 "European Journal of Applied Physiology" measured the effects of respiratory training to increase breathing rate and tidal volume, the amount of air you move in and out of your lungs, on swimming endurance. Working with your swimming coach to increase your respiratory capacity may increase your ability to swim half a mile without tiring. Swimming involves complex movements and coordinating your arm and leg movements efficiently takes practice. Having a swim coach evaluate your movements can help pinpoint your weak spots. When you don't move in a smooth, coordinated fashion, you use up extra energy that may make it difficult to swim half a mile. Pull through the water with your hands, keeping your elbows bent at a 90-degree angle rather than keeping them locked, swim coach and physical therapist Jen Adley recommends. Kick from your hips and don't kick harder than you need to to propel yourself through the water. When you swim, you move against the resistance of the water. Fighting against the water slows you down and tires you out. To reduce the resistance as you swim, many coaches recommend swimming uphill, meaning that your hips ride higher in the water than your head does. Keeping your body alignment as straight as possible decreases friction and drag. Lifting your head changes your body alignment. Keep your head down, leading with the top of your head rather than your forehead, with the water level running across the crown of your head, swim coach Priscilla Kawakami says on the Beginner Triathlete website. Fear can make your body rigid, which uses up extra energy and makes it harder to swim long distances. If fear holds you back when swimming half a mile, especially in open water or water over your head, get comfortable by practicing in shallow water. Knowing you can simply stand up to avoid drowning takes away the fear that may make you flail too much in the water or breathe inefficiently during training. 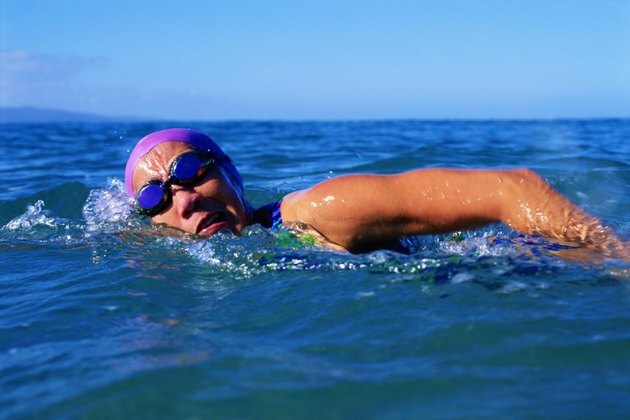 Start with short distances and gradually increase until you can easily swim half a mile. Once you're completely comfortable in shallow water, move into the deeper water. Can Holding Your Breath Under Water Increase Your Running Ability? How Many Laps Should I Swim to Lose Weight?